PR: Hitting the App Store on Mar 6, "Monty Python: The Holy Book of Days"
MELCHER MEDIA RELEASES NEW iPAD APP�"MONTY PYTHON: THE HOLY BOOK OF DAYS"
NEW YORK, NY (March 2, 2012)--Melcher Media--the creators of the bestselling app "Al Gore - Our Choice: A Plan to Solve the Climate Crisis" (winner of a 2011 Apple Design Award)--announce the release of a brand new iPad app: "Monty Python: The Holy Book of Days" in conjunction with the debut of the film on Blu-ray(TM) with UltraViolet(TM) from Sony Pictures Home Entertainment. Hitting the App Store on March 6th, "Monty Python: The Holy Book of Days" fully submerges Python fans in the world of Monty Python and the Holy Grail. Melcher created this app together with John Cleese, Terry Gilliam, Eric Idle, Terry Jones, and Michael Palin of Monty Python to give a behind-the-scenes look at the filming of the troupe's second feature film. In the interactively interactive "Monty Python: The Holy Book of Days," the 20th Century's most brilliant and outrageous comedy troupe takes us along on their foolhardy quest to make an epic film in just 28 days (coconuts not included). In order to re-create authentically the shooting of Monty Python and the Holy Grail, the Pythons have gone back to their vaults and pulled out a treasure trove of never-before-seen (or heard) outtakes, rehearsals, raw audio recordings, songs, sound effects, scripts, dozens of stills, and much, much more. New illustrations, animations, and the story of the filming in the Pythons' own words make each of the film's production days come alive. Every page of "Monty Python: The Holy Book of Days" is packed with Python history, from Michael Palin's day-by-day diary of the filming, to Terry Gilliam's storyboards, to the original continuity sheets covering every shot, to 360* views of actual props and costumes from the movie. It's an unprecedented and a totally new look at Monty Python and the Holy Grail. 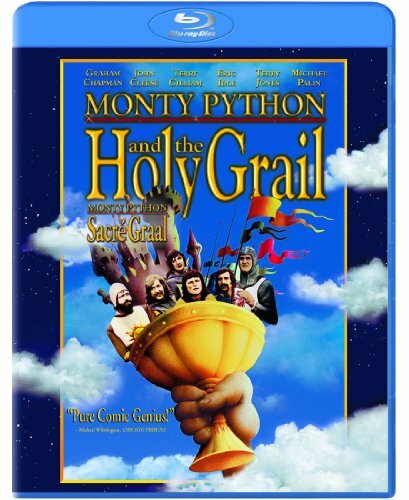 Also debuting on March 6th is the troupe's most highly regarded comedy classic--Monty Python and the Holy Grail--for the first time on Blu-ray(TM) with UltraViolet(TM) from Sony Pictures Home Entertainment. The Blu-ray features new exclusive bonus material, extended scenes, commentary, photo galleries, and songs. "Monty Python: The Holy Book of Days" provides a rich Second Screen companion to the Blu-ray. With your Blu-ray player synced via your WiFi network, your iPad becomes your remote control and jump to the exact scenes in the movie that you are browsing in the app. It's an entirely new way of watching the film. For a limited time, Sony is offering a $5 mail-in rebate when consumers purchase both the Blu-ray and iPad app. * And more medieval madness! Monty Python and the Holy Grail has a running time of 92 minutes and is rated PG. Melcher Media is an industry-leading full-service editorial and production firm with a team of award-winning editors, publishers, and art and production directors who find inventive ways to connect big ideas with even bigger audiences. By creating stylish, market-savvy books and apps that break conventions, broaden impact, and attract new audiences, Melcher Media artfully defies the high-culture/low-culture divide to mix sophistication with popular accessibility. Their work includes more than 125 books with some 12.5 million copies in print. Melcher Media created the the iPad app "Al Gore - Our Choice: A Plan to Solve the Climate Crisis" which won the 2011 Apple Design Award and was the top grossing iPad app in the books genre for more than five consecutive weeks last year. Other apps that Melcher has in production now include the Autodesk(R) Imagine, Design, Create App and the world's first interactive multimedia Haggadah which will be released in time for Passover. Visit www.melcher.com for more information. Sony Pictures Home Entertainment is a Sony Pictures Entertainment (SPE) company. Sony Pictures Entertainment (SPE) is a subsidiary of Sony Corporation of America, a subsidiary of Tokyo-based Sony Corporation. SPE's global operations encompass motion picture production, acquisition and distribution; television production, acquisition and distribution; home entertainment acquisition and distribution; worldwide television networks; digital content creation and distribution; operation of studio facilities; development of new entertainment products, services and technologies; and distribution of entertainment in more than 142 countries. Sony Pictures Entertainment can be found on the World Wide Web at www.sonypictures.com.